Saturday night, but we decided to cook at home instead of going to a restaurant. 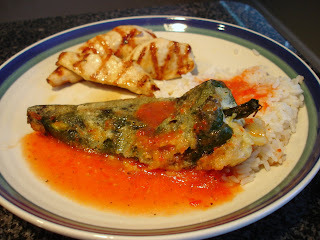 We decided to grill - fish for Jon, chicken for me (see post below for the great marinades we used) - so it was the perfect night to make a mess in the kitchen by trying a new side. Roast chilies: Roast chilies directly on the burners of a gas stove over medium-high heat, turning with tongs, until skins are blistered and slightly charred, 4-6 minutes. You could also broil them on the rack of a broiler pan about 2 inches from the heat. Immediately transfer to a large bowl and cover; let stand 20 minutes. Make tomato sauce: Puree all sauce ingredients except the oil in a blender until smooth. Strain through a medium-mesh sieve into a bowl, pressing on solids and then discarding them (I didn't strain - my sauce was smooth enough). Heat oil in a pot/skillet over medium-high heat until it shimmers. Carefully pour in sauce and simmer gently, stirring occasionally, 10 minutes (sauce should still be thin). Season with salt. Stuff and fry chiles: Carefully rub skins from chiles leaving stem attached. Cut a slit lengthwise then carefully cut out seedpod and ribs without tearing the pepper. Wipe clean if needed. Warning - my fingers were still burning this morning from this step!! Stuff chiles with cheese and close by overlapping the slit; I used a toothpick to help keep them closed. Heat 1/2 inch oil in a heavy skillet over medium heat until it registers 360 on thermometer (I didn't use a thermometer). While oil heats, beat egg whites with 1/8 tsp salt using an electric mixer until they just hold stiff peaks. Whisk yolks with 1/8 tsp salt, then gently fold into whites. Pour flour in a fine mesh sieve and dust chiles, turning them slightly to coat all sides. 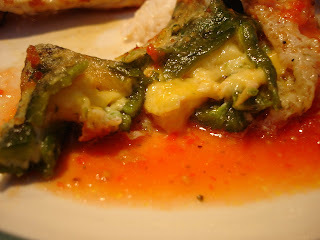 When oil is ready, dip chiles in egg (hold by stem), then fry, turning once until golden on all sides. This took about 4-5 minutes. Then transfer to a paper towel to drain. Plating: Spoon some of the sauce onto a plate. Place chiles in sauce. To eat them, I put some rice on my place, put the chile on top, and then poured some of the sauce over everything. Look how yummy they look with the cheese oozing out! I ate two with dinner and have one leftover that I may go eat for lunch. I'd definitely make these again and I wouldn't change a thing about this recipe. 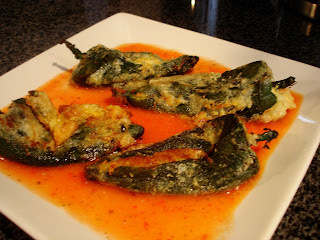 I love poblano peppers, especially prepared as Chiles Rellenos. It always seemed like a dish I woudn't bother making at home, but it sounds like it's really not too hard. Yum!